Davey Water Products can assist any pool builder, landscaper or home owner make their pool and surrounds a stunning feature of the home. Davey Water Products can assist any pool builder, landscaper or home owner make their pool and surrounds a stunning feature of the home with a complete range of accessories and features. 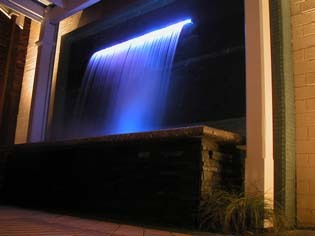 One of the most visually appealing is the Waterblade waterfalls and waterwalls. Manufacturered in Australia, the Waterblade products are available in a wide range of sizes to suit various lengths and widths for easy installation, and is suitable for new installations of to increase the aesthetic appeal of existing walls and pools. Featuring clear lip designs whereby a natural cascading effect is produced, or a remote controlled LED colour light for brilliance at night. 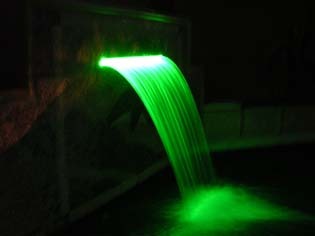 Available in many lengths and widths, can be run from existing pool pumps or set the feature up with a new pump and timer and control the lights and water separately. For an even more spectatular feature in the backyard, why not combine multiple Waterblades at different heights and widths and make it even more stunning. There is nothing more peaceful and relaxing than the sound of waterfalls gently flowing over rocks or into a pool or pond, and now Davey and WaterBlade can make this a reality. Make any pool and backyard the feature it should be, and install a WaterBlade from Davey.